Hewlett-Packard said it would introduce a touch-enabled version of the Chromebook 14, and it's finally landed in the U.S., just a few days before Christmas. The computer maker recently released the $440 HP Chromebook 14-x050nr Touch through its online store. The new model is upgraded from the latest base edition Chromebook 14, which HP introduced at IFA Berlin in September. HP bumped the display resolution up to 1920-by-1080 from 1366-by-768, and the new laptop also doubles the storage and RAM to 32GB and 4GB, respectively. The major change, however, is of course the addition of touch. The story behind the story: PC makers have been adding touch to Chromebooks for some time, but it's mostly been a frill. Why bother using touch, after all, with software designed for a traditional mouse and keyboard? That situation may change in 2015, however, as Google continues to experiment with running touch-centric Android apps on Chromebooks. Beyond the aforementioned resolution, RAM, and storage bump, the new touch-friendly version of the Chromebook 14 features the Nvidia Tegra K1 processor just as the other late 2014 models do. You also get 802.11ac Wi-Fi, Bluetooth 4.0, 1 x USB 3.0, 2 x USB 2.0, 1 x HDMI, microSD card reader, and webcam. The new laptop weighs 3.77 pounds and comes in only one color: white with silver accents. At $440, the new touch version of the Chromebook 14 is quite a bit more expensive than the lower-grade version that is priced at $300. 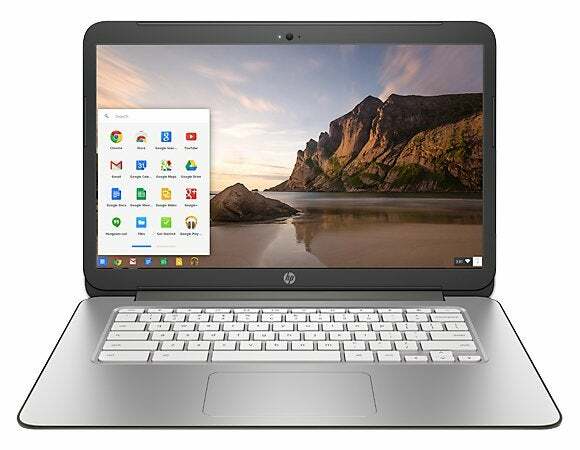 The cheaper version of the Chromebook 14 is currently unavailable directly from HP, but it is still for sale on sites like Amazon.